S Ramaswamy is a senior Professor at inStem. He was one of the founding members of inStem and C-CAMP. He is himself an entrepreneur and has been involved with mentoring startups for over a decade now. It is well known that several disruptive innovations come from areas that are dense in institutes doing good academic research – think, the California Bay area and the Boston area in the US, the London area in the UK, the Tel Aviv area in Israel, etc. Many articles and books have been written about why this happens. There are also theories on how more innovation happens in large cities than in smaller ones and how recently crowded cities are becoming difficult places to innovate. For every idea proposed on why some places create more innovations than others, there are a number of examples that contradict them. Given these large number of contradictory ideas and thoughts, and the well known cultural aspects that are important for innovation, how does one create an ecosystem that facilitates and nurtures the process of innovation? I don’t think there are any easy answers to these questions or even a correct answer. In the Indian scenario, the first challenge is cultural. It is well known that the best innovations come from path-breaking discoveries made in academic labs that do very good basic research. Today, world over (including in India) this has become a problem. There is a constant thrust to convert scientists who are good in basic science into translational-scientists. Almost every scientist in the biological sciences talks about curing cancer, neurodegenerative diseases or whatever is the glamorous flavour of the times. So, the first step for me would be to ensure that the best of the lot in basic sciences are supported enough to follow their most innovative ideas. The results they produce might provide unexpected discoveries that can become the basis of disruptive innovations. The ecosystem hence should have the leadership that recognises the importance of good basic science and supports it. The way science is being done is changing very quickly – most questions that people are asking today come from the ‘intersection of ideas’ (read Medici Effect, by Frans Johansson), and the ‘intersection of disciplines’. The amount of information and knowledge that is available in any area has grown immensely. Hence, gaining in-depth expertise in any area requires years of study, research and work. This creates a contradiction of sorts – if it takes years to gain expertise and this expertise cannot create innovation on its own, then, how does innovation happen? It happens when people with different expertise and ideas work with each other It happens when people with different expertise and ideas work with each other. It happens when ideas collide with each other – it is impossible to know in advance, which ideas will collide to create something disruptive? What the ecosystem needs to do hence, is to create enough opportunities for people with different ideas to collide. The best thing the ecosystem can do to increase the probability of success is to increase the number of collisions. This tends to happen naturally and most often in informal settings. More open discussion spaces, coffee shops, open-laboratories, shared equipment and mixing of academia & industry practitioners, should be feasible in the ecosystem to increase the occurrence and variety of collisions. Today, technology has become complex. Life-sciences innovation has its quirks like any other area. A lot of work in biology and medicine today, depends on the ability to use state of the art technology, which is evolving and changing at a fast rate. The cost of sequencing, for example, is decreasing very quickly (Flatley’s law). Availability and accessibility to technologies like NextGen sequencing help science to be state of the art, as well as better. These technologies, are expensive, have a short lifespan and require significant expertise to use. Which means, we require not just cutting-edge equipment, but also expert manpower. 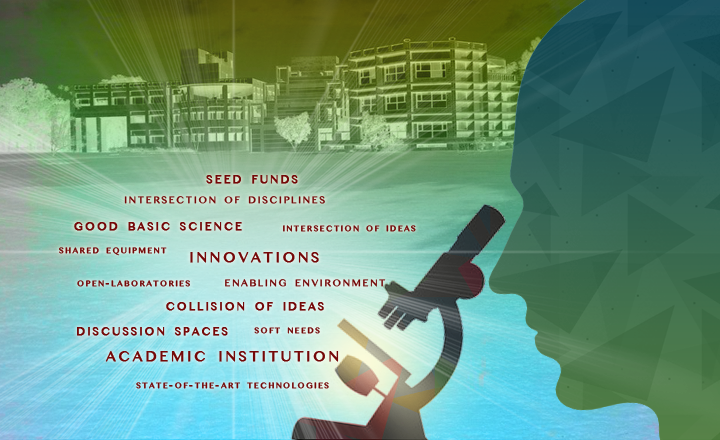 An ecosystem that provides easy access to state of the art technologies along with expertise in using it, is essential for promoting good science-entrepreneurship. Most starting science-entrepreneurs are good at their science and technology skills but lacking in other skills that are often crucial for success. These enterprises need help in making business plans, getting connected to the right mentors, running the business – help with Human Resources and the many other things that go into creating a successful and marketable product. Often, the entrepreneurs run around and spend a lot of time to acquire and learn these skills. An ecosystem where there is a constant support for many of such soft needs will relieve more time of the inventor/developer to focus on the product. Interestingly, this often happens over a period of time in most incubation facilities, where there are incubatees are at different stages. They begin to learn from each other. So, an ecosystem that can support start-ups at different stages is critical. Incidentally, the best places where such ecosystems can be created are close to large academic centres. In the Indian context, the leadership of the academic entity plays a key role. A supportive leadership that also encourages its faculty, students and other scientists to engage in entrepreneurial activity goes a long way in greasing the wheels. This also enables creation of new science-entrepreneurship and encourages these minds to think of ways to convert their discoveries into innovations that can translate into useful products and solutions. I have not addressed the need for funding – the presence of small funding that will allow discoveries to be converted into innovations, is also a key element. These seed funds can go a long way to test several proof-of-concept ideas quickly in an enabling environment. This can prove to be a great bonus in an ecosystem aiming to accelerate science entrepreneurship. Finally, as Peter Drucker famously said, “culture eats strategy for breakfast”. While much of the above can be easily created, the most difficult is to create an ecosystem that is culturally supportive of innovative science- entrepreneurship and celebrates failures as much as successes of the enterprises that get seeded.